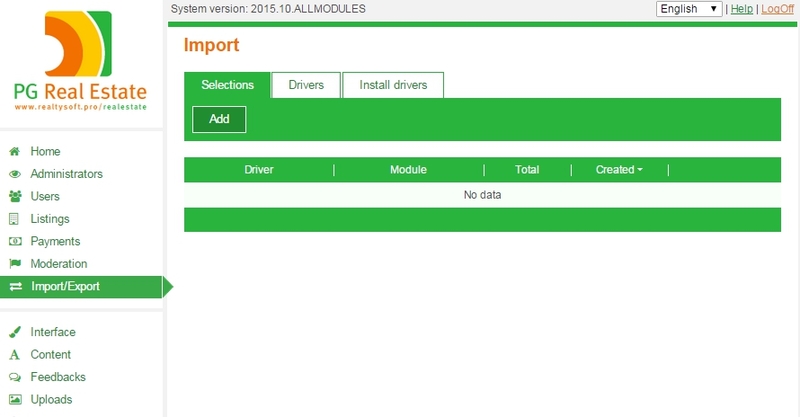 The Import module helps to populate your site with listings by importing objects in a certain format. In default site functionality .csv and .xml formats are available. 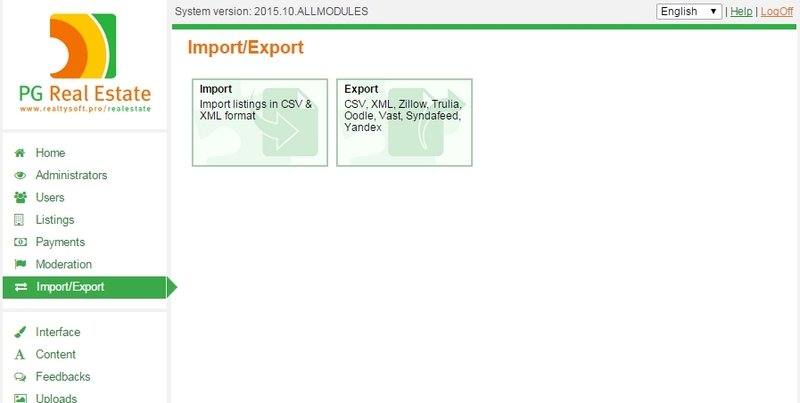 Also you have an option to purchase additional modules to import in RETS and idx formats. In this section you have 3 tabs: Selections, Drivers and Install drivers. 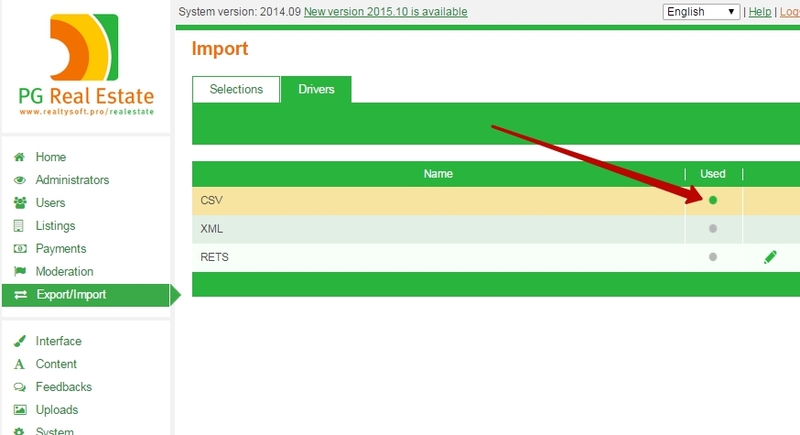 Drivers – all available import formats (.csv, .xml, RETS). Selections – samples/uploads, customized import formats. Install drivers – all available drivers. How to set import on you real estate site? Go to the Administrator panel > Import/Export > Import > Install drivers and install drivers that you want to use on your site. *If you have idx Broker module, this driver will appear in the list. 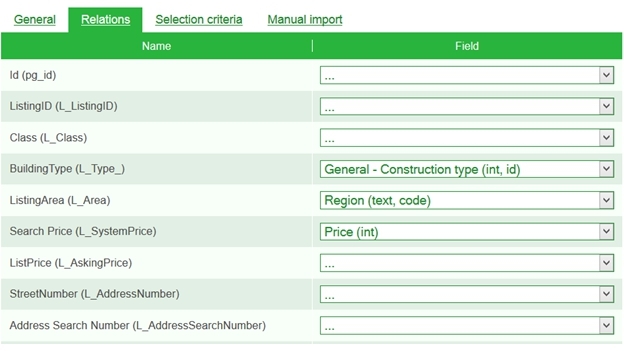 Fill in necessary information and use a .csv import on your real estate site. 2) .XML is a file with a .xml extension (or a separate file, or an archive containing images and file). 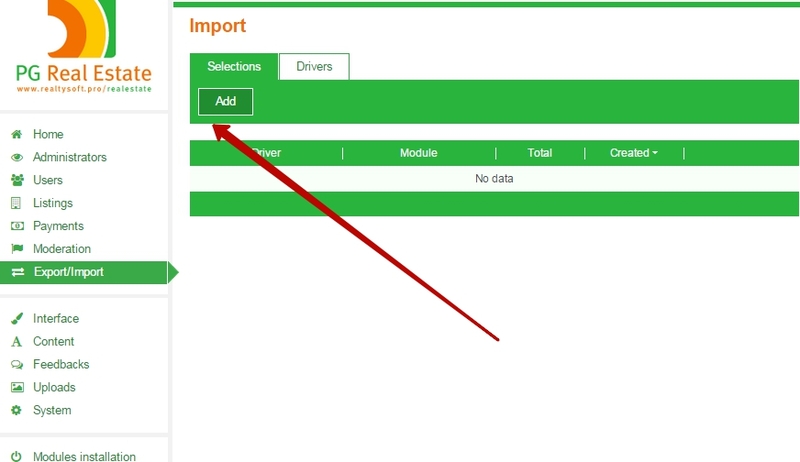 You can activate it in Import/Export > Import > Drivers by the same procedure as a .csv. 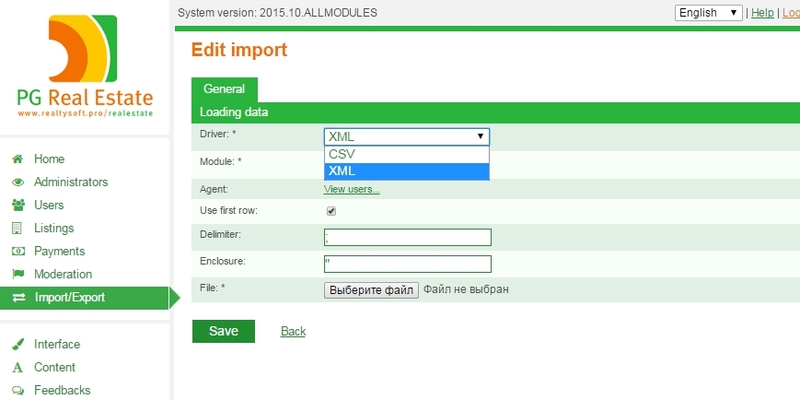 Fill in the information and use .xml import on your site. 3) RETS (Real Estate Transaction Standard) – data transfer standard for the MLS-base, used in USA and Canada. MLS (Multiple Listing Service) is a massive database of estate property, which allows agents and brokers to share personal and listings information. The method of database depends on your agency and MLS association it relates to. To activate RETS on your site go to Drivers and press ‘pencil’ icon. You will be redirected to the next setting page. Step 1. Setup and save the following using the RETS login information the MLS or your client has provided you. The image below is only an example, your specific login information will be different. 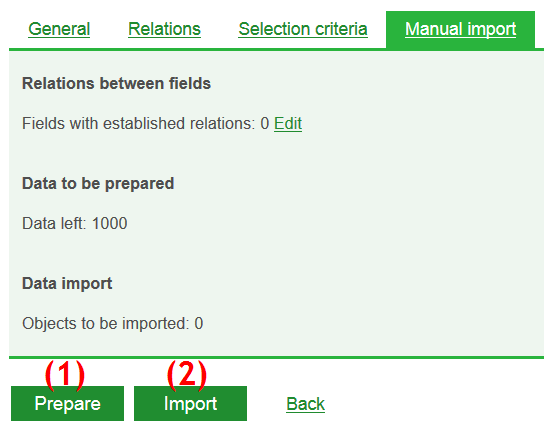 Relations – connection layout between the fields, coming from the RETS supporting server, and the fields in our products database (same as in other import/export types). 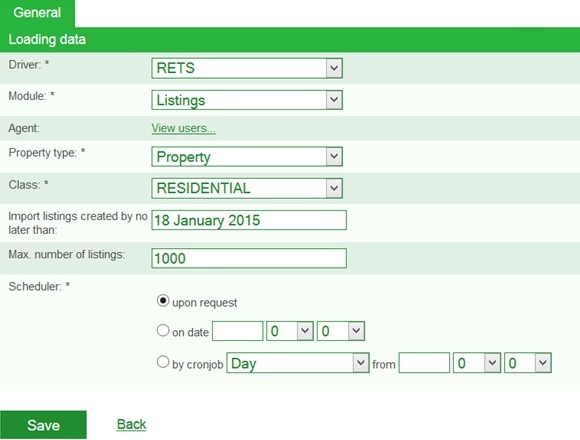 Selection criteria – fields that can be used for (or listings filter). List of the fields shown is defined by the server. One can specify the exact value or use modificators defined by RETS standard. 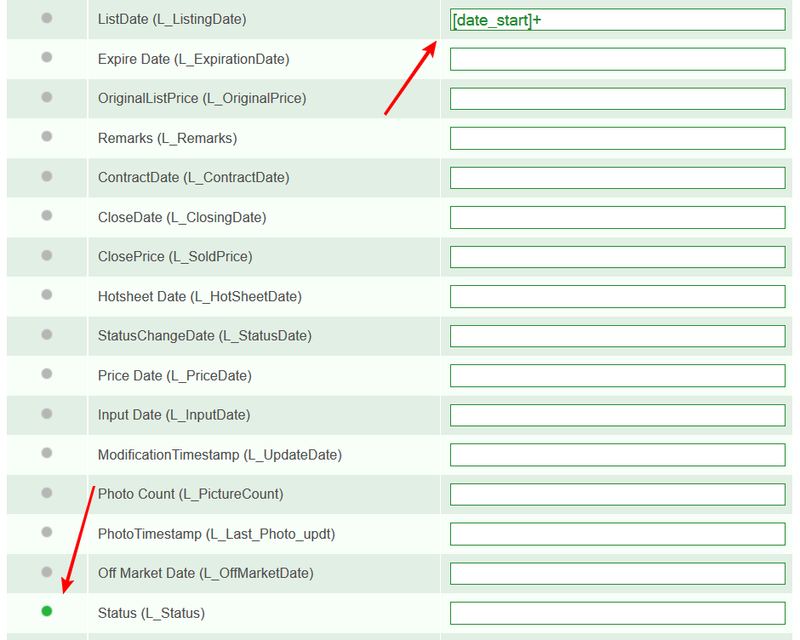 • It is obligatory to set the value “[date_start]+” in “ListDate” field. • If the bullet in the first column is enabled, then this field must be present in the search (server requirement). 2. If there is ready data, it is added to other listings. The first step is executed by pressing “Prepare”. The second one – by pressing “Import”. If there is data in the temporary table, “Data import” will show the number of objects. “Data to be prepared” always shows the value set as the maximum number of downloaded listings (how many listings can be taken from the feed at a time, the field from the first tab). The automatic import doesn’t require these two steps. Maximum listings shown – 500. This is maximum number of results that can be received from a request. If there are more of them, it is necessary to specify the search criteria (idxbroker condition). The listings are not downloaded, they are shown in our product’s frame, as the feed allows only viewing (the downloading is denied).